KUBINKA (Moscow Region), August 24. /TASS/. The United Arab Emirates is showing interest in Russian-made Uran-9 reconnaissance and fire support robotic vehicles, Head of the Federal Service for Military and Technical Cooperation Dmitry Shugayev told TASS on Thursday. "A number of foreign customers, including representatives of the United Arab Emirates, are showing interest in Uran-9 modern robotic systems. However, the Russian side has not yet received any official delivery request," he said. The Uran-9 is designed to conduct remote reconnaissance and provide fire support for all-arms, reconnaissance and anti-terror units. The vehicle comprises two reconnaissance and fire support robots, a prime mover for their transportation and a mobile control post. 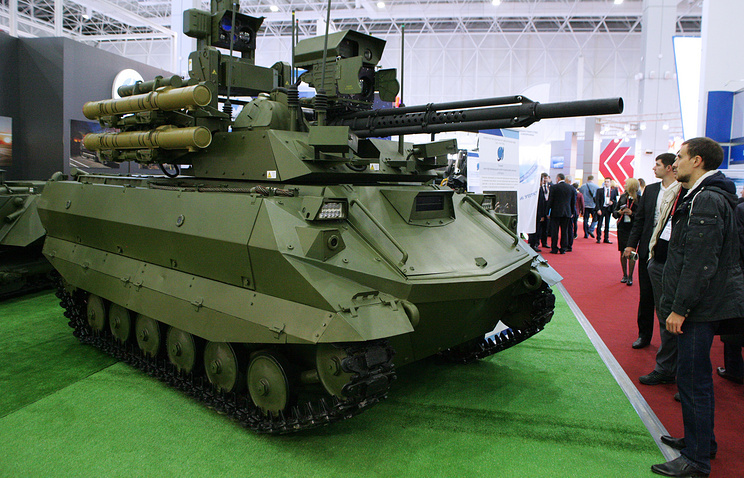 The reconnaissance and fire support robots are armed with a 2A72 30mm automatic gun with a 7.62 coaxial machinegun and Ataka anti-tank guided missiles. The vehicle’s armament may vary, depending on the customer’s requirements. The robots are equipped with a laser radiation warning system and equipment designed to detect, identify and track targets.